Keratitis is an inflammation of the cornea. The cornea is the clear, dome-shaped tissue in front of the eye covering the pupil and iris. Keratitis has numerous causes, such as bacteria, virus, fungus, or even parasites. Even minor injuries or improper use of contact lenses can cause noninfectious keratitis. Addressing keratitis in a timely manner lowers the risk of complications. That’s when the treatment is most effective. If it’s caused by an infection and left untreated, keratitis may permanently damage your vision. 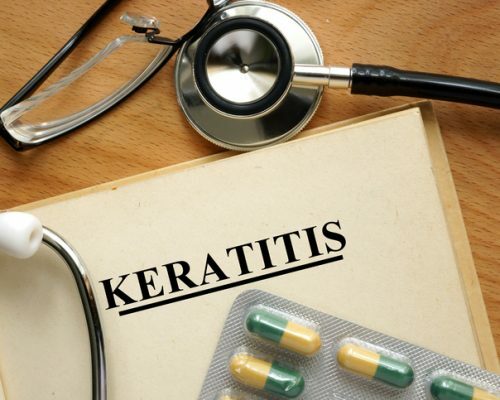 Keratitis can be caused by a minor injury to the eye, such as scratches on the surface, contaminated contact lenses, viruses like herpes, and contaminated water from swimming pools, oceans, and lakes. Bacteria, viruses, fungi, and parasites can reside in water, so if your face makes contact with contaminated water or if you go swimming, you can develop keratitis. Keratitis complications include chronic corneal inflammation, chronic or recurrent viral infections, open sores on the cornea, corneal swelling, temporary or permanent reduction in vision, and blindness. You should see a doctor for keratitis if you notice any of the symptoms related to keratitis. The earlier you start the treatment, the better you can treat it. Delaying treatment increases your risk of complications. Keratitis types differ based on location, severity, and cause. If keratitis affects only the surface of the cornea, it is called superficial keratitis. If it affects the deeper layers of the cornea, it is known as stromal keratitis or interstitial keratitis. Keratitis may also affect the center of the cornea, the peripheral part of the cornea, or both. Keratitis may be mild, moderate, or severe, depending on the level of inflammation. Keratitis may also be acute or chronic, meaning it can be a short term condition that’s treated once and doesn’t return, or it can be recurring. Once you experience or notice the symptoms of keratitis, it’s important that you promptly make an appointment with your doctor. Your doctor will perform an eye exam, a penlight exam, a slit-light exam, and laboratory analysis. Laboratory analysis involves samples of tears or cells from the cornea to determine the cause of infection. Your doctor will prescribe appropriate treatment depending on the cause – bacterial, viral, fungal. If keratitis is noninfectious, you may not require treatment. The injury will have to heal on its own. Prescription medication may ease pain, and wearing an eye patch can help reduce the risk of further injury or irritation. Treatment for infectious keratitis depends on the type of infection. For bacterial keratitis, either antibacterial eye drops or oral antibiotics may be prescribed. For fungal keratitis, antifungal eye drops are prescribed. Viral keratitis is treated with antiviral medications administered either orally or through eye drops. To treat keratitis caused by parasites, antibiotic eye drops may be prescribed, but generally, parasitic keratitis is more difficult to treat. If keratitis does not respond well to medications and permanent damage has occurred to the cornea, you may require a corneal transplant. Keratitis is a preventable condition. And prevention begins with proper contact lens care – if you wear them. Ensure your contact lenses are always clean and your hands are clean when you put your contacts in. Furthermore, do not wear contact lenses for too long – discard them when the time is up. Lastly, use proper cleaning solutions for contacts and always change solution instead of adding new solution to the old one. To prevent viral keratitis, avoid touching cold sores or herpes blisters and then touching your eye. Avoid corticosteroid eye drops unless prescribed. If keratitis reoccurs numerous times due to contact lens use, you may want to switch to prescription glasses.